« Ciampino è ora realtà! Last Thursday, for the “Giovedì nerd” (i.e. “Nerd Thursday”) held every week at the Fusolab in Rome we had a Google Summer of Code Meetup. Ninux.org is participating in the Google Summer of Code program thanks to Freifunk, that is acting as an umbrella organization for us. 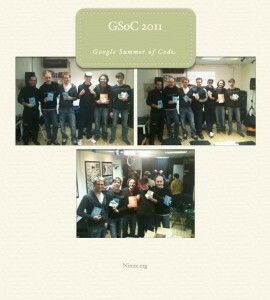 We talked with many people from all around Rome about the GSoC projects that we had completed in the last years and about our new project proposals, which can be found here, and distributed the gadgets (big and small notebooks with the GSoC logos and some Google-pens) sent to us from Mountain View! This entry was posted on Wednesday, March 30th, 2011 at 2:35 pm	and is filed under Google Summer of Code, Uncategorized. You can follow any responses to this entry through the RSS 2.0 feed. You can leave a response, or trackback from your own site.